Just wanted to tell you my new baby granddaughter is here! Aleksandra arrived last Thursday, Jim and Rosa over the moon with her. She was only tiny 4lb, but doing very well…..a real little beaut!! Soon be flying off to Oz to have a good cuddle……? Hope everyone’s well and busy gardening….I raked, spiked and cut the lawn this afternoon….it was so hard packed…I’m blaming Lottie for that as she races up and down with her ball…..? Must be absolutely lovely to have grand children. Thanks so much Hywel...for being so tiny she was wide awake! Love your new avatar....have you painted Bella? It's lovely! How kind of MargorieS, and it's very good, I bet she's sitting on the fence isn't she.....Bella I mean, not Marjorie..?. Yes she's on a fence :) It's taken from a photo I posted. Congrat to everyone, Janey... Especially grandma! What a beautiful little girl, welcome little one ? Congratulations to all family from me also, Janey . Exciting times for you. Lovely news ! A new grandchild is always so welcome . Oh thanks everyone for all those lovely comments and best wishes to them and me! I will be going over soon but you are so right, Internet and FaceTime.....textie and little videos, I feel like I'm there already without the flight....I wish! Aleksandra is home now, I'm so pleased they are all together.....those broken nights start here......saying that as you get older they do become the norm in fact I think I'm almost nocturnal.....so any night feeds whilst I'm there....ha ha. What a beautiful little girl, Janey, small and perfect. She is a little treasure. What a lot of fun you will have when you go over to meet her face to face. Congratulations to the family too. 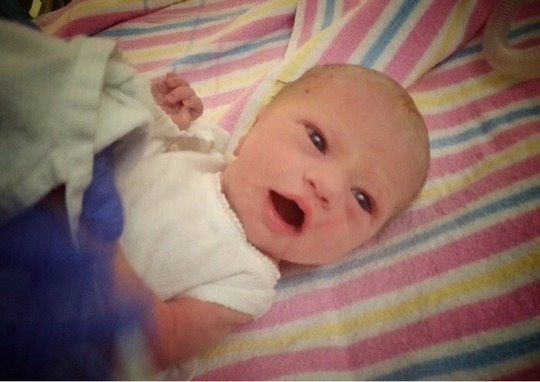 What a gorgeous baby she is, you must be thrilled to bits and so excited! You will be able to hold her soon and please take a photo or two for us!! Oh what super news Janey, a perfect little girl, a tiny treasure.